In a study conducted by Saint Louis University and published in the March issue of the Journal of The American Medical Directors Association, researchers found that a trained therapy dog named Sparky and a Sony AIBO had nearly equal success in decreasing loneliness of nursing home residents. "AIBO is charismatic if you start to interact with him," said the study's author, Dr. William Banks, a professor of geriatric medicine at Saint Louis University. "He's an engaging sort of guy." I just wonder what happens when AIBO's batteries run down? Wired has the story here! I'd say don't try this at home, but then again chances are that you don't have a robotic arm at home... but what the heck where these guys thinking? According to G4 TV's The Feed Blog, there will sadly be no demo version of GTA 4. "If there was [going to be a demo] we would have talked about it. With a game like this the guys at Rockstar North will want to spend every minute making the game look great. Most people know the concept of GTA anyway. I don't know that the demo is worth the time and effort." Guess we'll all have to wait for the real deal! Microsoft announced on Thursday that it will be cutting prices on Windows Vista in 70 countries later this year to coincide with the upcoming release of Vista Service Pack 1 (SP1). “We anticipate these changed will provide greater opportunities ... to sell more stand-alone copies of Windows,” said Brad Brooks, a Microsoft corporate vice-president. The price cuts will vary by country. According to the Globe and Mail "The announcement comes on the heels of sales data that showed a 30 per cent drop in money spent for software at U.S. retailers in January, according to market research firm NPD." Coincidence? Here is a look at the first game developed for the Microsoft Surface PC, "Firefly" where the object is to coral more fireflies into your jar than your opponent. The video is a gizmodo find and was shot compliments of Sarcastic Gamer. You won't be wowed by the game play as it is pretty simple but consider the interactive nature of the interface and think of all of the possibilities! I love this device! Google has launched a new service known as Google Sites, that will become part of the company’s applications suite, which includes g-mail, calendar, docs, spreadsheets and presentation software. Google Sites is a team collaboration tool built on Google's acquisition of technology created by JotSpot. The application allows work teams to create and share web documents that include text, images, videos, spreadsheets and other types of documents. The free offering from Google is aimed squarely at Microsoft's Sharepoint software and competes with other web services like 37signals' basecamp. I'll reserve comment on the service until I've had a chance to play with it, but it's getting to the point where companies, small ones at least, really should be considering these services as a cost conscious option. See the NYTimes Bits article for more. And You Thought The iPhone Was Cool! Just look at what the folks at Nokia have conceived! The "Morph" is a concept phone that, once built, would use Nanotechnology to allow the device to be folded and bent, resist dirt, have chameleon like properties, and of course function as a telephone! The brainchild of Nokia and the University of Cambridge in England, Morph is still but a concept with "bits and pieces" having been developed to date. The promotional video is pretty impressive just the same. The Svalbard Global Seed Vault officially opened on Tuesday on the island of Svalbard in Norway. The vault is meant to shield the world's seeds from climate change, earthquakes, war and other disasters and has room for 4.5 million varieties of agricultural, horticultural and medicinal plants. "What we've done is establish essentially a physical insurance policy here in Svalbard so we can ensure the safety of these seeds," said Cary Fowler the executive director of the Global Crop Diversity Trust. It's designed to withstand earthquakes and even a direct nuclear strike and is intended to last hundreds and even thousands of years according to this CBC article. Not all of the seeds are in one basket however, Svalbard is meant to be a backup to 1,400 other seed banks worldwide. I guess it's comforting to know that these things are being taken seriously, it's just a little depressing to think that we have to go to these extremes! The Canadian Defence Department is warning soldiers about the dangers of posting information to sites such as Facebook and of posting photos from the battlefront in Afghanistan. In a memo obtained by CBC News the military says "Al Qaeda operatives are monitoring Facebook and other social networking sites," and that "This may seem overdramatic … [but] the information can be used to target members for further exploitation. It also opens the door for your families and friends to become potential targets as well." Some question the motives and whether or not this is prudent advice or just the military's attempt at controlling the imagery of what is really happening on the ground. I think that if I were in the forces I'd be thinking long and hard about what I was publishing, we are all aware (or at least we are lead to believe) that there are cells operating within our borders, regardless of where we live in. Found this video thanks to engadget. The video captures a Danish wind turbine as it spins out of control due to break failure. The turbine eventually destroys itself. 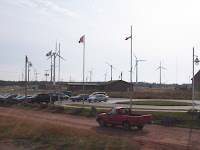 Interestingly, there are 16 turbines by the same manufacturer, Vestas, at the North Cape Wind Farm near Tignish, Prince Edward Island, about an hour and a half or so from where I live. They have been in commission since 2001, the one in the video is said to be 10 years old... 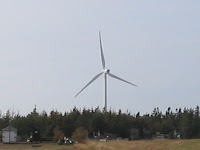 The pictures below where taken at North Cape in 2004. EBay, Nasdaq Stock Market Inc., Time Warner Inc.'s AOL, Nickelodeon and Salesforce.com Inc. are all quick out of the gate creating downloadable, desktop versions of their websites using the latest technology released by Adobe Systems Inc. today. Adobe AIR "will allow any company with a Web site to inhabit a permanent spot on people's desktops." according to the Globe and Mail. Running on any operating system, applications developed for AIR are like widgets for the desktop, constantly updating as long as your PC is connected to the internet. The goal appears to be taking the browser out of the equation. “The browser was in the way and the widget, in some instances, was in the way,” says Adobe spokesman Adrian Ludwig. In a test flight that carried no paying customers, Virgin Atlantic flew a Boeing 747 from London's Heathrow Airport to Amsterdam's Schiphol Airport, while one of its four engines used a mixture of coconut oil and babassu oil. The fears where that at altitude the biofuel might freeze and therefore only one engine was tested and apparently all worked well. Critics of the biofuel movement include Greenpeace and say that cultivating crops to make biofuel is not sustainable and will lead to reduced land for food production while those behind the technology are hoping that biofuel will have a lower carbon footprint than fossil fuels. "Some of us in the industry are actually doing something about reducing our carbon emissions. I don't think that's a gimmick. It's progress," said Paul Charles, Virgin Atlantic spokesman. CBS has put the entire original Star Trek series online, 3 seasons (1966 - 1969), for free viewing. It would appear however that you require a US ip address as I am unable to see any of the content. Interestingly, when I click to play the shows I get a Star Trek like computer voice telling me that "This content is currently unavailable." Come on CBS, all I wanted was a Sunday morning matinee of "The Trouble With Tribbles"!